Today's guest real room makeover is from another newbie blog, 2 seasons, written by a mother and daughter duo renovating their respective homes 500+ miles apart. How adorable is that? I'll let Janette share what she did in her kitchen but I'll warn you now that you just might fall in love with this kitchen's mascot, lulubelle. Greetings, everyone.  I am so excited to be a guest blogger today at Brooklyn Limestone. Even though I am old enough to be Stefanie's mother, we have some things in common. We both live in townhouses that we completely remodeled, and we are both avid world travelers. After selling our family home in the burbs, my husband and I down-sized to a townhouse with 3,000 square feet. We were ready to experience life in the city (Lexington, KY) with the convenience of walking to many events. We hired an architect who worked with us to get the design that we wanted, and then our crew went to work in January. We moved in mid-May and are really enjoying the decorating and "making it ours" process. Today I am going to give you a tour of our kitchen. I hope you enjoy it. The first two are photos I took on the day we first looked at the place. The owner was a single gentleman who spent a lot of money on new granite and stainless appliances, but they just didn't speak to us. We were able to salvage the cabinets and move them to our new pantry. The wall on the left is now gone. This is his kitchen eating area. Notice the red below the chair rail and the gold above it. I took this photo after we had removed his Pergo floors but before the painters did their magic. The purple area is the pantry. I revealed the new/improved pantry in an entry here. Welcome to our new kitchen. This is the full view looking in from the hallway. Though the light isn't too good in this shot, you can see that we went with a bluish gray peninsula that is glazed white, a farmhouse kitchen sink, and carerra marble on all of the countertops. We chose white cabinets, and the pennisula's glaze helps it blend with them. It has a lot of features I think you'll like. For instance, I have shelves for my cookbooks. And the cabinet door there hides our candle storage. Here is a close-up of the glazed door. This is the side of the peninsula opposite the sink. The stools are from CSN. There is a shelf area with glass doors to display some of my Hall's teapots. And there is a wine shelf. The door to the left provides more storage. This shot shows it without the stools. This is our eating area. The cow? She's "Lulubelle". I ordered her from an artist named Roz Art on Etsy. She had me at moo hello. A local shop framed it for me, and she waited patiently for this remodel project to finish so we could move in and she could claim her spot of honor in the kitchen. This shot shows our built-in hutch. Let's take a closer look. I think the copper pots work great here. We used the same cabinet hardware in the kitchen, wet bar, laundry room, guest room built-in, and all of the bathrooms. I've opened the door so you can get a better look. Some of the dishes are special, like my grandmother's flow blue, the meat platter I got when staying with some nomads in Mongolia, and our old iron stone, and other things are there because they are blue or white. A lamp maker here in Lexington made this lamp for me out of an extra silver tea pot. I think it is so sweet. My brother bought this hydrant at an auction years ago for $2.50. That was before I had it refurbished. Every time he sees it, he regrets that he gave it up. I think the kitchen is the perfect place for a fire hydrant. Don't you??!!?? This bench is very versatile. I like to move it around, but it works here for now. I bought the two silk floral pillows in Bangkok. They are by Jim Thompson, who revived the silk industry in Thailand and then mysteriously disappeared. The other two pillows were made by moi. When we decided to sell our last house, my friends gasped because they knew how much I obsessed over enjoyed the six-burner Thermador stove I had. Well, luckily, I was able to get another, except this one has only four burners with a griddle. Empty-nesters don't need six burners! It has gas burners with an electric oven and griddle. L.O.V.E. it! Remember that wall I showed you in the beginning? It is now open to the great room, which as you can tell, still has some unpacking waiting in it. This opening made a huge difference with the amount of light the kitchen gets and with the flow. The architect and I were in total agreement on this. I am not really a fan of painted ceilings, (here) but I saw a kitchen in a magazine with white cabinets, carrara marble counter tops, creamy walls, and a light blue ceiling. I knew then our kitchen ceiling would be a soft blue. We really, really like it. If you are ever in Lexington, stop in, and I'll make us a pot of tea (or maybe a mint julep). Take care. Loving! Lulabelle. The kitchen looks fantastic. Gorgeous kitchen! Love the cabinets with all the marble and the blue ceiling in particular. Oh and that stove is kind of insane (in a good way!). also, i like that you squeezed in the copper pot storage on the side of the cabinets. Thanks so much for letting me be a guest host at Brooklyn Limestone. In case anyone is wondering, the kitchen wall color is Stucco, and the ceiling color is Iceberg. Both are Sherwin Williams colors. Beautiful! I love your choice of colors! Please share your paint colors! Very nice! LOVE the gray cabinets and ceiling! Wow, what am amazing space! I am in love with the color of the island. I would love to paint my kitchen grey! So loving your cow art! I have to go and check that artist out. I can't imagine anything better for that space. She is perfect there! The color and glaze on those cabinets makes me drool! I love your kitchen! We purchased our home just a few years ago but have had a couple of teens to get married/out to college and funds just haven't been available. Thank you for helping me to dream and plan. I love your taste. Oh goodness! I love the kitchen sooo much! I have a similar hydrant near my fireplace. It's definitely a conversation piece. Great job! We love the colors and white marble counter tops! What a difference the renovation made. Job well done! OH my goodness, I Love it!. You are amazing! The kitchen wall color is Stucco and the ceiling color is iceberg. They are both Sherwin Williams. Luuuuuurving that painting!!! It's fabulous. Also love the color of the island - what an original idea! beautiful! great moo cow painting! love all the storage in the island! i'm sure they are enjoying their space! Love, love the idea behind the mother, daughter duo!!!! The painted ceiling is awesome! LOVE the color. If possible could you share the paint color for your grey cabinets? I have been searching hi and lo for the perfect blue gray paint in that vein for awhile now and yours looks dead on what I have been thinking in my head. What a homey kitchen! I have a nice big island, but none of those amazing features - love them, and added them to my list for my dream house! Wow! What a gorgeous kitchen! I love that she reused the original new cabs. All of her choices were just beautiful! Thanks for sharing. I'm crazy for the kitchen island ... and I love the painted ceiling! would like to check it out if you have a spare minute. I really love the little touches and differences in your kitchen! Lulabelle is gorgeous, and I really like the teapot lamp and coloured ceiling. We're about to remodel our house so I can't wait to tell hubby I've decided on a blue ceiling ;-P We too are travellers so I love it how you have so many things to remind you of your journeys and the people you met. Thanks for sharing your home with us! Love the unit color. Looks a bit like Farrow and Ball - French Grey. A really lovely makeover. Well done. i love that hydrant and the gorgeous cushions!